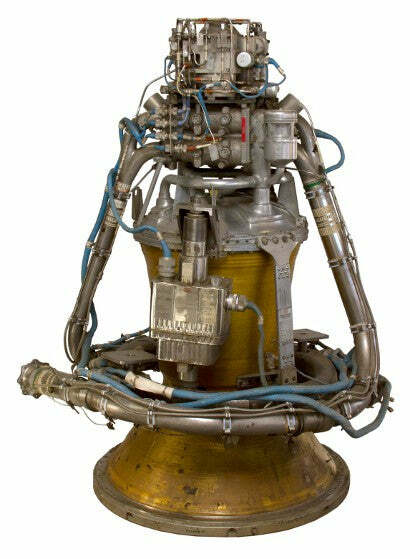 An unused Apollo Service Propulsion System (SPS) rocket engine is the standout lot in Regency Superior's May 24 auction in New Jersey. The engines were used to place Apollo spacecraft into and out of lunar orbit between 1968-1975, with the capability to be restarted for mid-course corrections. The SPS engines functioned flawlessly on all Apollo and Skylab missions. The unused example at auction was capable of producing a nominal thrust of 20,500 pounds using hydrazine fuel and nitric oxide. Weighing almost 3,000 pounds and standing more than five feet in height, it will sell with a $750,000-$1m estimate. The few remaining flown SPS engines now exist only in museums, with this believed to be the only example of its type remaining in private hands. Accompanying the rocket are two large Service Module helium tanks, which were positioned above the SPS engine and used to pressurise propellants, eliminating the need for a turbo pump. The spherical tanks are made from stainless steel and each measure 40 inches in diameter. Also featuring in the sale is a $20 gold coin taken to the Moon's surface aboard Apollo 17 by Gene Cernan in 1972. The lightly circulated coin is valued at $25,000-50,000, and will be accompanied by a typed signed letter from Cernan, stating that the coin spent three days sat on a rock during America's final manned mission to the Moon. Paul Fraser Collectibles has some of the finest space memorabilia for sale, including Apollo 11 autographs and a complete set of Moonwalkers signed photos.